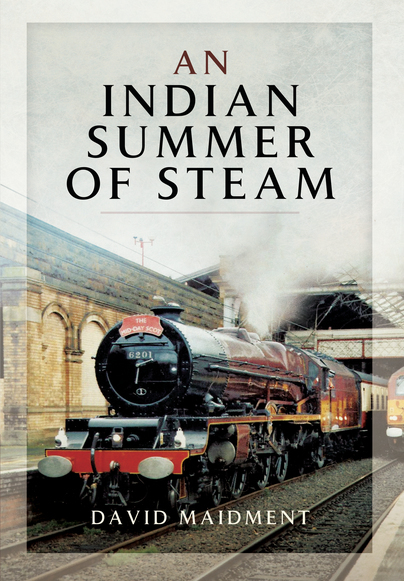 You'll be £25.00 closer to your next £10.00 credit when you purchase An Indian Summer of Steam. What's this? 'An Indian Summer of Steam' is the second volume of David Maidment's 'railway' autobiography, following his first book 'A Privileged Journey', published in xxxx. David was a railway enthusiast who made the hobby his career. After management training on the Western Region, between 1961 and 1964, he became a stationmaster in a Welsh Valley, an Area Manager on the Cardiff – Swansea main line and radiating valleys, the South Wales Train Planning Officer, the Head of Productivity Services for the Western Region and subsequently the British Railways Board, before four years from 1982 as Chief Operating Manager of the London Midland Region, the BRB's first Quality & Reliability Manager in 1986, and finally British Rail's Head of Safety Policy after the Clapham Junction train accident, until privatisation.rn This experience led to a number of years as an international railway safety consultant, and, as a result of an encounter on an Indian railway station during a business trip abroad, to found the 'Railway Children' charity to support street children living on the rail and bus stations of India, East Africa and the UK, described in 2012 by an officer of the United Nations Human Rights Commission as the largest charity in the world working exclusively for street children. All this is the background to the descriptions the author gives of the last years of steam and his many journeys and experiences during his training in South Wales and the South West, his travels all over BR from 1962 until the end of steam in 1968, his search for steam in France, East and West Germany and China and the steam specials in Britain, France, Germany and China after the demise of regular steam working. The book includes over 100 black and white and 100 colour photos, most taken by the author during his travels, and nearly forty pages of logs of locomotive performance in Britain and the continent. rn All royalties from the book are being donated by the author to the charity he founded, a brief description of which is included in the last chapter of the book. A wonderful book full of nostalgia written by a fellow traveller from the real days of steam.